This two day course is designed to expose the clinicians to the advanced surgical and orthodontic aspects of the Accelerated Osteogenic Orthodontics™ (AOO) technique and to the unique manner in which these must be coordinated to maximize the potential of this technique. Upon completion the clinician should be able to utilize the new diagnostic parameters needed to treatment plan the various orthodontic classifications and properly design the surgical aspects needed to support the orthodontic objectives. Attendees receive 16 CE credits (AGD). This course is presented by Dr. William Wilcko and Dr. Thomas Wilcko, who over the past 14 years have developed and perfected the Accelerated Osteogenic Orthodontics™ technique. 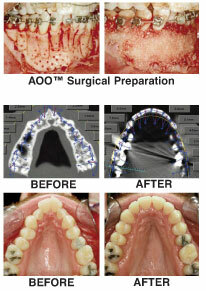 More than 700 professionals in 29 countries have been trained in the AOO™ technique. Private practice of general dentistry in Clarion, PA. He is Editor of the Journal of Oral Implantology, President of the American Board of Oral Implantology/Implant Dentistry, Adjunct Associate Professor at the Duquesne University School of Pharmacy and Clinical Instructor at the Department of Restorative Dentistry, State University of New York at Buffalo. • The rational and physiologic basis for rapid tooth movement facilitated with a one-stage surgical procedure. The role that CT scan imaging can play in orthodontic diagnosing and treatment planning. • Sorting through the misunderstandings of rapid tooth movement. Shedding the mechanical mind set of “bony block” movement and replacing this with the physiologic interpretation of “bone matrix transportation”. • Proper utilization of bone thinning and activation to take full advantage of the demineralization phase of the RAP. • Adapting to new orthodontic treatment parameters that take into consideration the significant increases in the limits of tooth movement and the increase in the speed of tooth movement. • The importance of alveolar and gingival grafting to provide a more intact periodontium and increased long term stability. • Orthodontic versus orthopedic forces in de-crowding, expansive movements and space closing. Modifying orthodontic adjustment scheduling to take full advantage of the “window of opportunity”. • Understanding the potential and limitations of subtle facial reshaping as a substitute for orthognathic surgery. • Review the coordination of the surgical and orthodontic aspects of the treatment plan. • Treatment Planning, treatment planning, & more treatment planning. • The proper sequencing of the rapid forced eruption of shallow versus deeply impacted teeth. • Understanding various health issues and medications that can impact the delivery of AOO™. • Points of interest and how to avoid complications. • Addressing the esthetics of the entire lower face and the adjustment of lip lines. • Marketing this technique to your patients. You will have the option of purchasing special marketing materials that have been developed to aid you in patient education and case acceptance. This entry was posted by Dental Continuing Education on May 8, 2009 at 11:25 am under Uncategorized. You can leave a response, or trackback from your own site. Follow any responses to this entry through the RSS 2.0 feed.